Communicating and organizing just got more sustainable! The Post-it Notes & Easel products that you love and have come to rely upon for fast and effective communication are now SFI® (Sustainable Forestry Initiative®) Chain-of-Custody Certified, which assures that the paper used to make these products is sourced from well managed forests where trees are replanted. 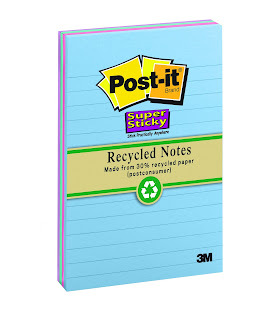 Post-it® Notes are also available in recycled materials. Choose from a diverse array of styles featuring earthy color palettes of soothing Nature’s Hues or vibrant Tropical Colors. Post-it Recycled Notes are an easy way to help minimize your environmental impact without sacrificing quality or changing your routine. Pairing the design sensibilities of the Post-it brand with environmental consciousness, the Post-it Recycled Collection includes products that contain a minimum of 30 percent post-consumer content. The collection is available in both Original Notes and Super Sticky varieties. This continues the Post-it brand’s commitment to a sustainable world, as all Post-it Notes have been and are recyclable in your regular paper waste stream. As an eco-smart option, Post-it Recycled Notes offer communication solutions and ideas that “stick” in the home and office. The recycled family of products supplements sustainable initiatives adopted by the Post-it brand, including attainment of certification from the SFI program for paper used in the U.S. manufacturing of all Post-it Notes and Post-it Easel products. Such certification ensures proactive alignment of responsible procurement objectives with high standards of forest management to promote sustainability. Backed by a rigorous, third-party audit, the SFI program’s commitment to well managed forests includes measures to protect biodiversity, wildlife habitat, and forests with exceptional conservation value, among other initiatives. 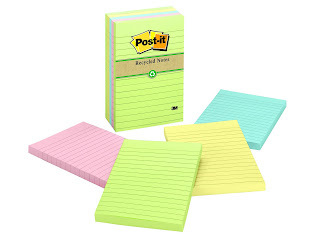 Building on a wide portfolio of products that make the art of communication easier, the Post-it brand has integrated sustainability efforts into a variety of categories including its recycled, super sticky, pop-up, and easel pad product lines. This embodies 3M Company’s longstanding commitment to develop products that make people’s lives easier and better, both for today and future generations. 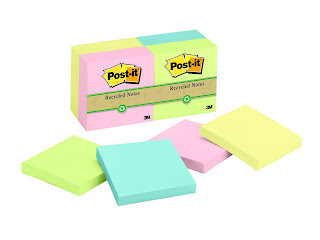 Post-it products are sold nationally at office superstores and mass merchandise retailers. 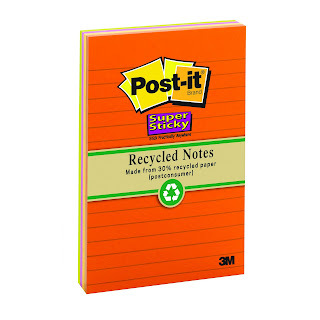 Suggested retail prices for the Post-it Recycled Collection range from $1.65 - $6.00 (except cabinet packs and easel pads). Who doesn't love Post-It notes?! I've been using them for years, and let me tell you, the Super Sticky are SUPER STICKY!!! I'm also glad that they started making Recycled Notes. That's great for them, us, and the environment! I love Post-It notes - any color - any size! I use them at home and at work! One winner will win 3 packs of Recycled Post-It Notes and another winner will win 3 packs of Super Sticky Recycled Notes. To enter, fill out the form! Remember to stop by Moody Mama Says and Everyday Baby Steps to enter one of their giveaways! There is a space on the form you can leave the link of the giveaway you entered!